Galloping Out, the Thoroughbred retirement program serving Chicago racetracks Arlington Park and Hawthorne Race Course, is holding its second annual pig roast fundraiser on Sunday, Sept. 16, at Arrowhead Farm in Long Grove, Ill. In addition to food and drinks, there will be games, live music, raffles and a silent auction with a number of unique offerings. 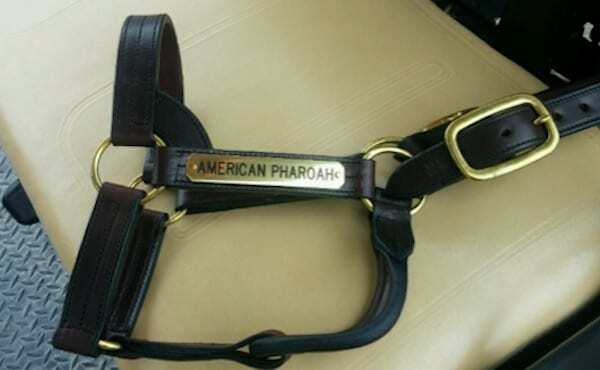 Among the many items included in the auction is a halter worn by 2015 Triple Crown winner American Pharoah, along with a certificate of authenticity. The halter was kindly donated by Coolmore America's Ashford Stud in Versailles, Ky., where American Pharoah stands at stud. Online bids can be made at http://www.32auctions.com/gallopingout. A 501(c)3 organization, Galloping Out is proudly accredited by the Thoroughbred Aftercare Alliance and is a grantee of Thoroughbred Charities of America. Galloping Out has successfully rehomed over 200 former race horses since becoming operational in 2010. The program is currently at capacity. Tickets for the event are $50.00 for adults, $10.00 for kids, and can be purchased online at their website gallopingout.org. This entry was posted in Horse Care and tagged american pharoah, Arlington Park, coolmore america, Galloping Out, hawthorne, Thoroughbred Aftercare Alliance, thoroughbred charities of america by Edited Press Release. Bookmark the permalink.